Gustav Mahler-Chor, Les Musiciens du Louvre / Marc Minkowski. Stage director – Ivan Alexandre. Wiener Staatsoper, Vienna, Austria. Saturday, October 22nd, 2016. On paper, tonight certainly promised something very special. One of the leading interpreters of the music of Gluck conducing his own outstanding period-instrument band, several very promising young singers combined with the full resources of one of the world’s pre-eminent lyric theatres. Certainly, musically it was a genuine treat for the ears but dramatically I had decidedly mixed feelings. 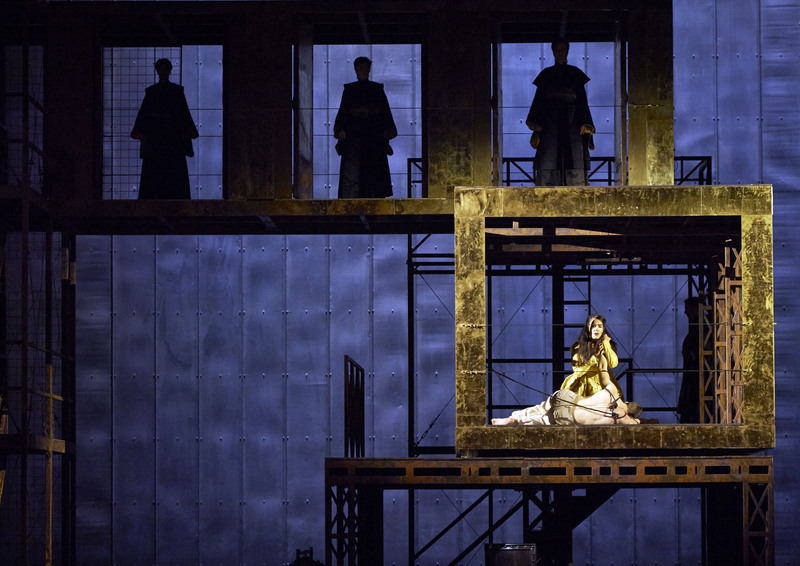 The staging was my first encounter with the work of Ivan Alexandre. The set (Pierre-André Weitz) was made of two interlocking two and three-story structures – which looked like something from Blade Runner – that held most of the action. Doors would open and close, hiding characters as they chose to appear or not. Costumes (also Weitz) looked straight out of Game of Thrones. 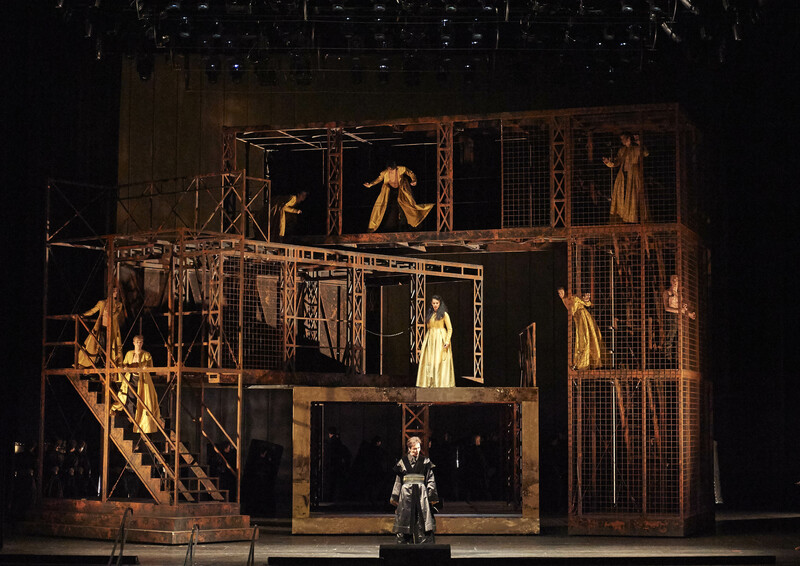 Alexandre’s staging focused on creating a visual narrative, using stage pictures to illustrate the action rather than using his singing-actors to create living, breathing personalities. That’s not to say that they did not incarnate the characters they were playing, there was certainly an element of that, but rather in a way what we saw was a visual reaction to the music. 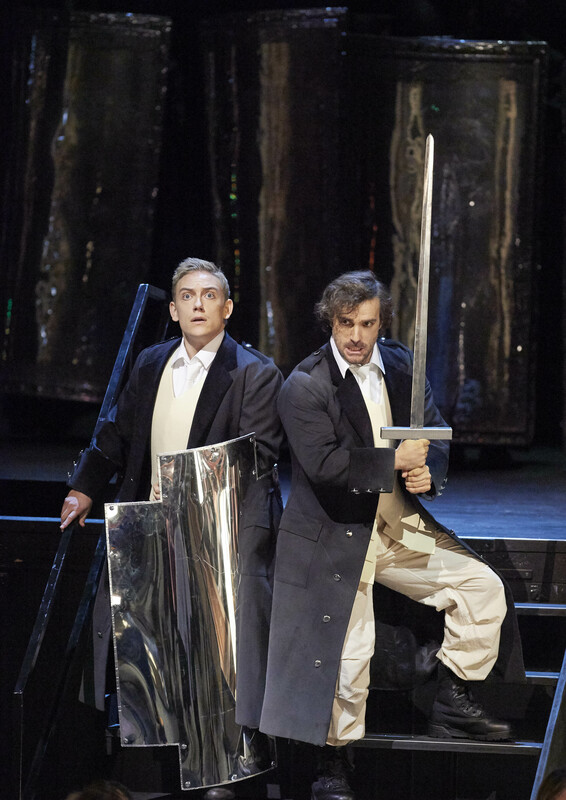 For example, as Armide emerged with a sword to decapitate Renaud, the lighting changed to reflect the change of mood in the music. Similarly, as she tried to lure him into her structure we saw multiple Armides doing precisely the same thing, using the doors of the structure to hide and appear at will. A corps of (generally shirtless) gentlemen dancers was used widely for visual interest and while seeing a group of buff guys do push-ups in unison was not unpleasant to the eyes, it was no replacement for the creation of living, breathing characters. Indeed, the personenregie so often felt that it consisted of marching people on and off (especially the chorus) with principals just parked at the front and delivering. 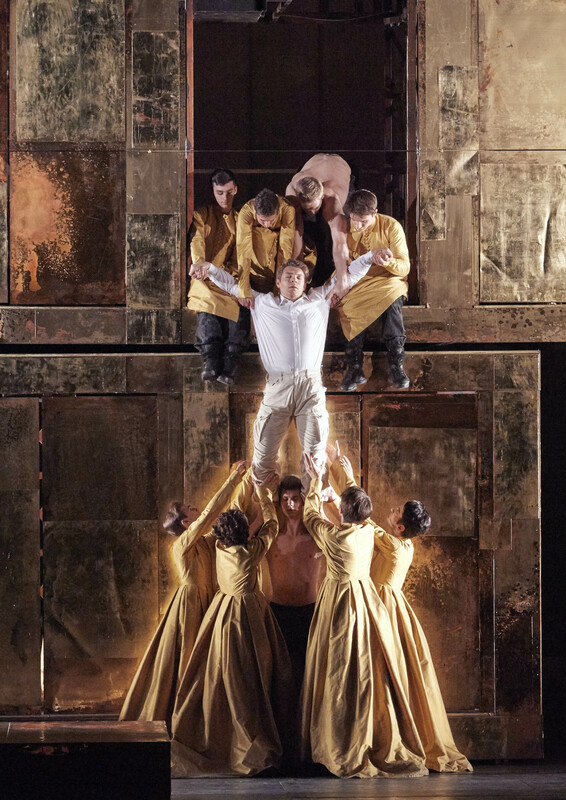 The one exception was Stanislas de Barbeyrac’s Renaud who was especially game in being manhandled and dropped from one level to another of the structure by the group of dancers, and who spent much of the latter part of the show in his underwear. Indeed, it was only at the end that we finally got a true sense of Armide and Renaud’s relationship. Finally, with both characters on stage alone they were given a chance to create real personalities. 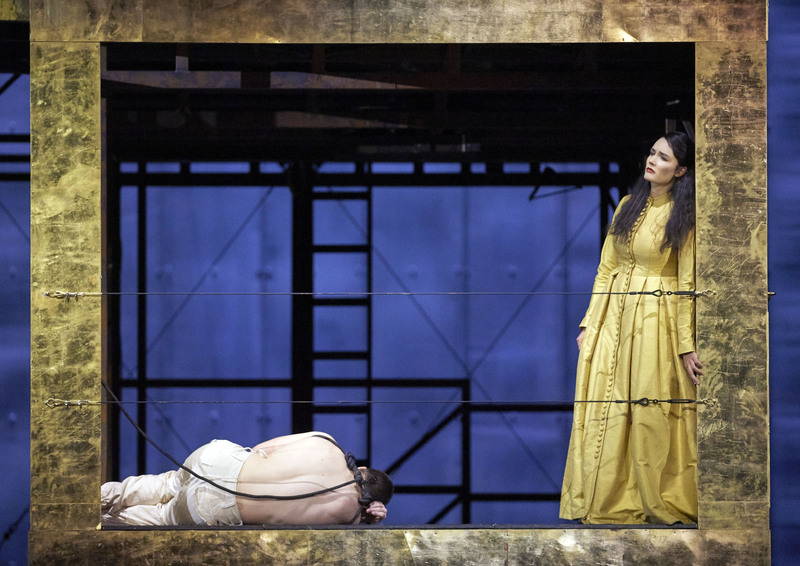 Likewise, in the final scene Gaëlle Arquez raged powerfully only to have the focus taken away from her by some random pyrotechnics and bright light beamed into the eyes of spectators. Often the fact that something is possible doesn’t mean it’s necessary and that’s certainly how this felt. Above all, I felt the staging overemphasized the visuals while keeping us as spectators distanced from the characters. Another reason for this was diction which, with a couple of exceptions, wasn’t always clear. Arquez’ Armide was interesting in this respect. In the more declamatory music her diction was impeccable, but as soon as she came to singing with an admittedly very good legato, diction would come in and out of focus. The voice itself is a very fine instrument – beautifully even from a rich, dark bottom to a bright and penetrating top. Hers was perhaps a more passive Armide than we might be used to and lines such as ‘où sont mes captifs?’ that should really blister with strength and power were very much less than that. Armide is a massive sing and Arquez was as fresh at the end of a very long evening as she was at the start. Certainly her ravishing number at the opening of Act 3 ‘ah! Si la liberté me doit être ravie’, was sung with a genuine sense of pathos and for a time the words really came into focus. Arquez is undoubtedly a very promising singer and I hope with time she can really bring out the text so much more. Stanislas de Barbeyrac’s Renaud did just that and proved that it is entirely possible to sing with an excellent legato and impeccable diction. It felt at the start of the evening that he was pushing the voice a little too much but he relaxed and sang with genuine feeling and warmth. He gave us some really beautifully supported diminuendi too. He also threw himself into everything asked of him by the staging. His ‘plus j’observe ces lieux’ in Act 2 was a real highlight of the evening. The remainder of the cast reflected the extremely high standards of the house. Paolo Rumetz was a grizzly and granite-voiced Hidraot. Margaret Plummer was perhaps a lighter-voiced Haine than usual but she inspired gratitude for the way she sang off the text. Olga Bezsmertna and Hila Fahima’s crystalline voices blended beautifully as Phénice and Sidonie. 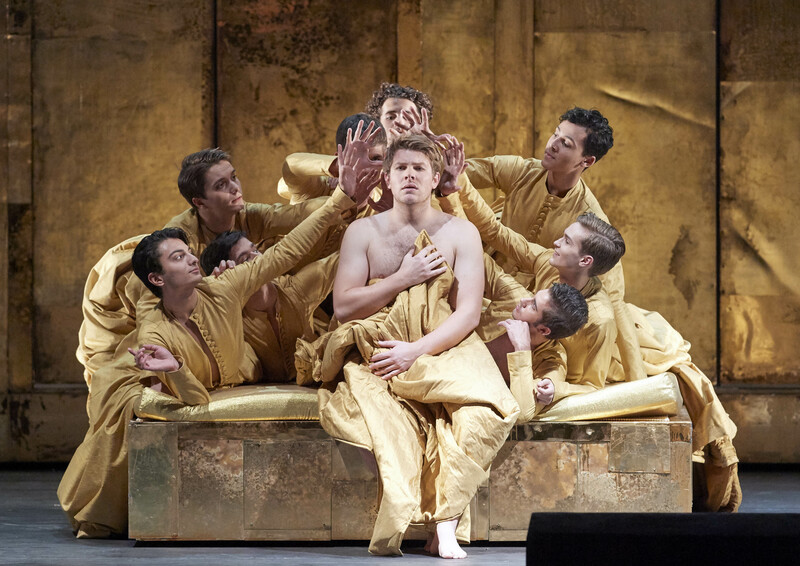 The revelation, for me, was Norwegian tenor Bror Magnus Tødenes. He is extremely young but already a very assured artist. His bright, light tenor has lots of ping and ease at the top. He also fully savoured the text and much of the words. Certainly, on the evidence of last night, he has a very bright future. The Gustav Mahler-Chor sang with good ensemble and bright, fresh tone. Getting to hear the Musiciens du Louvre was a real privilege and they made their presence felt right from the opening measures with raspy brass and those warm, gut strings digging deep. Indeed, there was a depth to the strong tone that felt like the plushest carpet but Marc Minkowski also got them to relish in the strange sound world as la Haine appears. It’s hard to imagine the work better conducted than Minkowski did tonight. He was constantly alert to the quicksilver changes of mood in the score. Tempi were swift but he also wasn’t afraid to pull back where necessary. His conducting really was core to the success of the evening. I certainly left the theatre with a sense that the evening was a success despite my many issues with the staging. Musically it was glorious, though I regret that the diction in many cases wasn’t clearer. The sound of that sensational band led by an inspirational conductor was something to treasure. Arquez impressed by her stamina and her undeniably beautiful voice and de Barbeyrac really was glorious. Yes, the production was visually striking but I longed for the visuals to take a back seat at times to really allow the singers through. Overall, it is a show that needs to be seen and in many respects, it would be hard to imagine it done better.